When we talk about bass ukuleles, what we talk about are essentially smaller versions of regular bass instruments. These bass ukuleles are easy to play and they sound quite similar to standard bass instruments. Additionally, they are much cheaper. However, no matter how similar to regular basses, the bass ukuleles are also quite different. Basically, it’s a bass guitar that is small and looks like a ukulele. It’s a miniature bass guitar. However, there are some important differences that distinguish the bass guitar from the bass ukulele. The strings on a bass ukulele are usually made of polyurethane which is much denser and thicker material than the one used for traditional ukuleles. So, the density of the strings makes up for the shorter length, allowing your bass ukulele to have such a deep bass sound. When it comes to tuning, the bass ukulele strings are tuned to EADG, which is the same tuning used for bass guitars, making the transition between these two instruments very easy. The bass ukulele is about the same size as the baritone ukulele which is the largest ukulele. There are two main types of bass ukulele bodies. We have a hollow body and solid body. The solid body bass ukulele sounds similar to an electric bass guitar while the hollow body uke sounds more like an upright bass. There are some fretless bass ukuleles, meaning that there are no frets on a fingerboard. This is another similarity to an upright bass. This allows you to use a wider variety of notes; however, it takes some time and practice to master playing the fretless instrument. How do you play the bass ukulele? When you play the bass ukulele you need an amp if you want anyone else besides you to hear it. Of course, when you practice you can use it without any amplification, but when it comes to performing, you really need to plug in. You might find using polyurethane strings a bit difficult in the beginning because they feel rubbery and not like the strings on your standard guitar or ukulele. However, you will get used to it. Additionally, polyurethane strings require a bit more time to break in so you might need to tighten them up more often during that period. While the standard ukulele is usually played by strumming, the bass ukulele usually needs to be played by finger picking technique. Finger picking technique allows you to create beautiful bass lines. The main thing most of the people usually look at is the price. However, there are some other things you ought to consider before you purchase your bass ukulele. For example, you should see if it comes with some additional helpful features. Some of the ukulele basses come with additional strings, cables, picks, gig bag, etc. which is quite convenient. These additional features are always welcome. Additionally, you need to check the quality of the materials that are used for the production of ukulele you intend to buy, the type of strings, and, of course, the dimensions. To put it simply, make sure your bass ukulele is made of high-quality materials such as mahogany, maple, rosewood, etc. and make sure that the strings on your bass uke are proper for your skill level. Octave range is another thing you might want to take into consideration. There are actually two types of bass ukuleles. There are bass and CONTRAbass ukuleles. Bass ukuleles are a bit smaller (around 30 inches) and they play the same open notes as the standard bass guitar (EADG), only one octave higher. Contrabass ukuleles, on the other hand, are a bit larger (around 32 inches) and they also play the same open notes, but the contrabass ukulele plays those notes in the same octave as the standard bass. Next thing you might want to consider is the pickups. The standard bass guitars usually have some sort of active electronic pickups, while the ukuleles, in most cases, use some type of piezo mic pickup. When it comes to bass ukuleles, they can use both. It mostly depends on the body type. Hollow body bass ukes usually use piezo pickups, while the solid body bass ukes usually use active pickups. Most of the bass players use fretted basses over the fretless. The same goes for bass ukulele players. However, when it comes to bass ukuleles, in particular, there are some enormous advantages of a fretless board. First of all, ukuleles are known for bad intonation. In this case, a fretless fingerboard can allow you to play notes higher up on your uke’s neck while staying in tune. Second, the polyurethane strings are known to suffer from unpredictable stretching. In this case, the fretless fingerboard gives you an option to compensate for flat tuning if it’s necessary. Generally speaking, this black bass uke made by Luna Guitars looks amazing. It is fully black, except for the fretboard. Even the hardware and the neck on the back side are black. The instrument features the remarkable baritone body design with beautiful high gloss finish. It is truly a piece of art. The top of this bass ukulele is made of spruce, while the sides and back are made of high-quality mahogany. The fretboard is made of rosewood. The choice of the top-notch materials gives this instrument an amazing durability as well as the remarkably beautiful look. 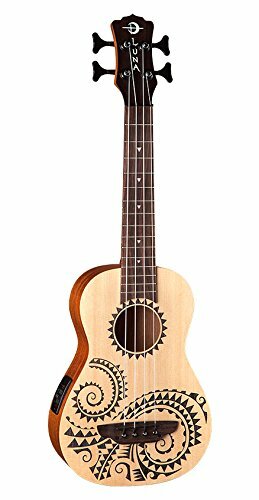 Luna Guitars black bass ukulele comes with one set of the flat-wound strings which are not quite proper for the beginners, but intermediate and advanced players can benefit greatly from this set of strings. When it comes to price, this bass ukulele is a bit pricier, but it offers an exceptional value for the price, and it is one of the most beautiful ukulele basses on the market today. Oscar Schmidt Comfort Series Bass Ukulele is one of the high-end bass ukuleles. 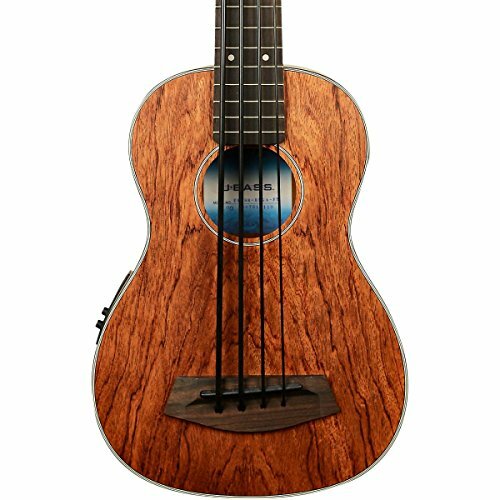 It is an electric-acoustic bass uke made of very durable and high-quality materials and it looks very nice. The body is made of solid wood parts and it has a unique asymmetrical design. The construction is a neck through body. The fretboard on this bass uke is made of rosewood and it feels quite gentle under your fingers while the high-quality hardware makes the tuning very easy. The Oscar Schmidt Comfort Series Bass Ukulele comes with one set of plastic strings which can be both advantage and disadvantage depending on your skill level. Plastic strings are more suitable for the beginners, but of course, strings can easily be replaced. This model is especially suitable for the beginners because of its low string action that makes the playing way easier. With that being said, even the more advanced players tend to spend some time accommodating to this model, but once you get used to it, it feels amazing. One of the big pluses is the complementary gig bag that comes with it. It’s a nice addition for keeping your bass uke safe and protected. The only disadvantage we could find is the price. It’s a high-end instrument and the price is a bit high. But if you are ready to give spend a larger amount of money you will get an amazing instrument. It is totally worth the money, but it is not really affordable for everyone. This particular model made by Luna Guitars is made of a few different materials which make it quite durable and amazingly good looking. As you might have guessed, the TAT in the model name stands for TATTOO, because of the unique design on the body. This ukulele bass has an amazing performance but people usually like it for its looks. It’s constructed of spruce top and mahogany sides and back as well as the rosewood fingerboard. All of the hardware on this amazing bass is black which makes it look even more beautiful. When it comes to sound, this model is a bit different than the rest of bass ukes. The strings are thinner and made of flat-wound metal so the uke can be tuned one octave higher than the standard bass ukes. It sounds amazing and we would say that the intermediate players can benefit the most from this model. You can’t really say that this is a beginner’s bass uke because most of the beginners find it a bit hard to play on metal strings. This bass uke is an electric-acoustic so it can be played both plugged in and unplugged. The instrument is quite affordable. It is not cheap but it is also not very expensive and it has an exceptional value for the price. Kala U-Bass Bubinga is a perfect for those of you who want their instrument to perform perfectly and to look amazing. It’s an electric acoustic bass uke, meaning you can play it unplugged or plug it into your amplifier if you wish. You will find the input on the right side of the instrument. The U-Bass model comes in three variations of the materials and colors – exotic mahogany, bubinga, and spruce. Each of these models sounds a bit different because of the different materials used for construction and the bubinga is most definitely the best one. Bubinga is much sturdier and the resonance is much stronger and the bass is way deeper. There is, of course, one downside. The midsection is not as pronounced as it is with the spruce. However, this is not really a deal breaker. The uke sounds good unplugged but you will get the best performance if you plug it into an amplifier. The sound it produces when plugged in closely resembles the sound of the upright bass. The price is a bit higher, but the instrument most definitely holds a great value for the price. UKB-22 NM is one of the first models in the UKB series. It gained a quite popularity because of its great overall performance and traditional design and look. It’s built of high-quality, sturdy materials that give it amazing durability. It features zebra wooden top and rosewood fingerboard. This model is an electric acoustic bass uke and it comes with a built-in preamp that helps you magnify the midsection, bass, treble, and volume. This uke comes with great Italian Aquila Nylgut strings which allow you to tune the instrument with great ease. One of the most prominent features of this model is the built-in tuner that makes the tuning even easier. Overall, this is one great bass ukulele. It has a traditional design and it’s very durable. It is not exactly cheap but it is not too expensive either. The uke has an amazing sound output and it’s a great choice if you are looking for an excellent bass ukulele. So, now that you have seen our selection of the top 5 best bass ukuleles, all you have to do is decide which model is the best for you. There are some high-end models here, and these are probably the best option if you want to spend a lot of money on something that will serve you well. However, in our opinion, the golden middle is what is “the best” for the most of the players. 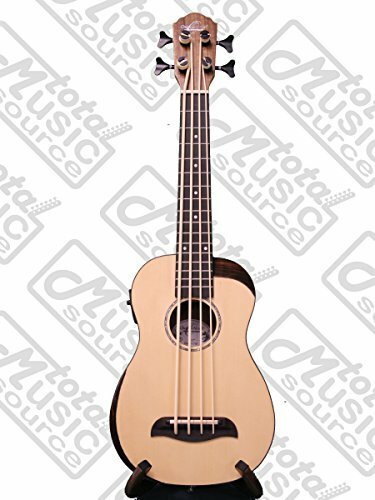 This is why our top pick is the Hadean Acoustic Electric Bass Ukulele UKB-22 NM. It can be used both plugged in and unplugged, the overall performance is great, materials are sturdy and durable, and it has some nice additional features such as the preamp and the tuner. Additionally, the price of this model is not too high and it has an exceptional value for the price.